With fundraising now complete for the Wealthy Theatre Sustainability Campaign, construction is now underway for upgrading the historic venue with energy efficiency. 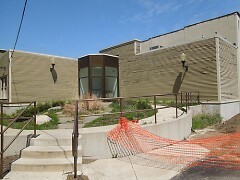 A community rain garden is a portion of the exterior improvements underway in Wealthy Theatre’s sustainability upgrade. A major fundraising project to help make the historic Wealthy Theatre sustainable and energy efficient began in 2011 – the centennial anniversary of the theatre. 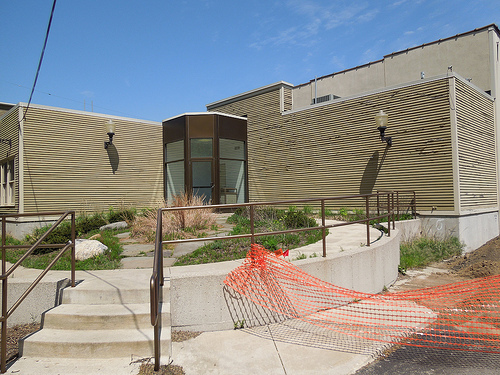 With the fundraising now done, construction and beautification projects are now underway, with completion of the more energy efficient upgrades to the theatre anticipated for later this summer. Community Media Center’s Wealthy Theatre Director Erin Wilson is in the Catalyst Radio studio to tell of campaign made successful through wide community support, and of the facility and technology improvements underway to help make the historic venue a part of Grand Rapids for the future. Music featured in this episode of Catalyst Radio is from local artist Brian Vander Ark, who staged a recent performance at Wealthy Theatre. The song “Surrender,” is from his 2011 album Magazine.